Administratively, Leningrad Oblast is divided into seventeen districts and a town of oblast significance, Sosnovy Bor. Lomonosovsky District is the only one in Russia which has its administrative center (the town of Lomonosov) located in the area of a different subject of Russian Federation (the federal city of Saint Petersburg, which is not a part of Leningrad Oblast). In terms of the area, the biggest administrative district is Podporozhsky District (7,706 square kilometres (2,975 sq mi)); the smallest one is Lomonosovsky District (1,919 square kilometres (741 sq mi)). Districts of Leningrad Oblast: 1. Boksitogorsky. 2. Volosovsky. 3. Volkhovsky. 4. Vsevolozhsky. 5. Vyborgsky. 6. Gatchinsky. 7. Kingiseppsky. 8. Kirishsky. 9. Kirovsky. 10. Lodeynopolsky. 11. Lomonosovsky. 12. Luzhsky. 13. Podporozhsky. 14. Priozersky. 15. Slantsevsky. 16. Tikhvinsky. 17. Tosnensky. with 14 volosts under the district's jurisdiction. with 19 volosts under the district's jurisdiction. with 7 volosts under the district's jurisdiction. with 12 volosts under the district's jurisdiction. with 15 volosts under the district's jurisdiction. with 22 volosts under the district's jurisdiction. The municipal divisions of Leningrad Oblast are identical with its administrative divisions. All of the administrative districts of Leningrad Oblast are municipally incorporated as municipal districts, and the city of oblast significance is municipally incorporated as an urban okrug. December 29 [O.S. December 18], 1708 Tsar Peter the Great issued an edict which established seven governorates. The description of the borders of the governorates was not given; instead, their area was defined as a set of towns and the lands adjacent to those towns. The present area of Leningrad oblast was a part of Ingermanland Governorate, which was renamed Saint Petersburg Governorate in 1710. The governorates were subdivided into uyezds, and uyezds into volosts. Eventually, parts of Saint Petersburg Governorate were split off to form separate governorates, such as Novgorod, Pskov, or Olonets Governorates. Vyborg Governorate, which was split off early, in 1812 was included into the Grand Duchy of Finland as the Viipuri Province, and in 1918 became a part of independent Finland. In 1913, Saint Petersburg Governorate was renamed Petrograd, and in 1924 Leningrad Governorate. The east and south of the current area of the oblast was transferred in 1727 to Moscow and Novgorod Governorates. After a sequence of administrative reforms, the northeastern part of the oblast ended up in 1801 in Olonets Governorate. In June 1918, five uyezds of Novgorod Governorate, including Tikhvinsky Uyezd, were split off to form Cherepovets Governorate, with the administrative center in Cherepovets. In 1922, Olonets Governorate was abolished, and Lodeynopolsky Uyezd (which contained all areas later transferred to Leningrad Oblast) was transferred to Petrograd Governorate. Thus, by 1927 the current area of the oblast was split between three governorates — Leningrad, Novgorod, and Cherepovets. Additionally, the areas adjacent to the Narva River, including the town of Ivangorod, were assigned to Estonia in 1920, following the Estonian War of Independence and the Treaty of Tartu, signed on February 2, 1920. Velikiye Luki Okrug (Velikiye Luki). Murmansk Okrug was not contiguous with the rest of Leningrad Oblast and was separated from it by the territory of the Karelian Autonomous Soviet Socialist Republic. The areas where Leningrad Oblast was established belonged previously not only to Saint Petersburg, Novgorod, and Cherepovets Governorates, but also to Murmansk and Pskov Governorates. In Borovichi Okrug: Belsky, Bologovsky, Borovichsky, Konchansky, Minetsky, Moshenskoy, Okulovsky, Opechensky, Orekhovsky, Rozhdestvensky, Torbinsky, Uglovsky, and Valdaysky. In Cherepovets Okrug: Abakanovsky, Babayevsky, Belozersky, Borisovo-Sudsky, Cherepovetsky, Kaduysky, Kirillovsky, Myaksinsky, Nikolsko-Torzhsky, Pestovsky, Petrinyovsky, Petropavlovsky, Prisheksninsky, Sholsky, Ulomsky, Ustyzhensky, Vashkinsky, Verkhne-Chagodoshhensky, and Yefimovsky. In Leningrad Okrug: Andreyevsky, Budogoshchensky, Detskoselsky, Kapshinsky, Kingiseppsky, Kolpinsky, Kotelsky, Kuyvozovsky, Leninsky, Lyubansky, Mginsky, Moloskovitsky, Oraniyenbaumsky, Pargolovsky, Pikalyovsky, Tikhvinsky, Trotsky, Uritsky, Volosovsky, Volkhovsky, and Zhukovsky. In Lodeynoye Pole Okrug: Andomsky, Kovzhinsky, Lodeynopolsky, Oshtinsky, Pashsky, Podporozhsky, Shapshinsky, Vinnitsky, Voznesensky, Vytegorsky. In Luga Okrug: Batetsky, Gdovsky, Luzhsky, Lyadsky, Oredezhsky, Osminsky, Plyussky, Polnovsky, Rudnensky, Strugo-Krasnensky, and Utorgoshsky. In Murmansk Okrug: Aleksandrovsky, Kolsko-Loparsky, Lovozersky, Ponoysky, Teribersky, and Tersky. In Novgorod Okrug: Belebyolkovsky, Bronnitsky, Chyornovsky, Chudovsky, Demyansky, Krestetsky, Luzhensky, Malovishersky, Medvedsky, Molvotitsky, Novgorodsky, Poddorsky, Podgoshchsky, Polnovo-Seligersky, Polskoy, Soletsky, Starorussky, Volotovsky, and Zaluchsky. In Pskov Okrug: Bezhanitsky, Chikhachyovsky, Dedovichsky, Dnovsky, Karamyshevsky, Krasnogorodsky, Kudeversky, Novorzhevsky, Novoselsky, Opochetsky, Ostrovsky, Palkinsky, Porkhovsky, Pskovsky, Pushkinsky, Seryodkinsky, Slavkovsky, and Vyborsky. In Velikiye Luki Okrug: Bologovsky, Idritsky, Ilyinsky, Kholmsky, Kunyinsky, Leninsky, Loknyansky, Nasvinsky, Nevelsky, Novosokolnichesky, Oktyabrsky, Ostashkovsky, Penovsky, Porechyevsky, Pustoshkinsky, Rykovsky, Sebezhsky, Sovetsky, Toropetsky, Troitsky, Tsevelsky, Usmynsky, Ust-Dolyssky, Usvyatsky, Velizhsky, and Velikoluksky. On October 1, 1929 Velikiye Luki Okrug was transferred to newly established Western Oblast. On August 15, 1930, the okrugs were abolished as well (with the exception of Murmansk Okrug), and the districts were directly subordinated to the oblast. Subsequently, the administrative divisions were merged and split on a regular basis, so that some districts were abolished, and others were established. On September 23, 1937 Vologda Oblast was established, and eastern districts of Leningrad Oblast were transferred to Vologda Oblast. On May 28, 1938 Murmansk Oblast was established, and the districts which belonged to Murmansk Okrug were transferred there. Between 1938 and 1944, the area of Leningrad Oblast approximately corresponded to the current area of Leningrad, Pskov, and Novgorod Oblasts. On March 22, 1935 Pskov and Kingisepp Okrugs, adjacent to the state borders, were established. In September 1940, both were abolished. After the Winter War in 1940, some areas which previously belonged to independent Finland were ceded to the Soviet Union, in particular, to Leningrad Oblast and to the Karelo-Finnish Soviet Socialist Republic. During World War II, considerable areas of Leningrad Oblast were occupied by German and Finnish troops and thus were outside the jurisdiction of the oblast. On July 5, 1944, Novgorod Oblast, and on August 23, 1944 Pskov Oblast were established. The areas of Estonia adjacent to the Narva River, including the town of Ivangorod, were transferred to Leningrad Oblast on November 24, 1944. They were shared between Slantsevsky (south) and Kingiseppsky (north) Districts. On the same day some areas, which are now parts of Vyborgsky and Priozersky Districts, were transferred from the Karelo-Finnish Soviet Socialist Republic to Leningrad Oblast. In 1948-1949, most of the names of Finnish origin were replaced by made-up Russian names. After 1944, some areas which belonged to Leningrad Oblast, were on several occasions transferred to the federal city of Saint Petersburg. After 1927 (with the exception of the aborted reform of 1963-1965) borders between the districts sometimes were modified, and as a result some of the districts were abolished. 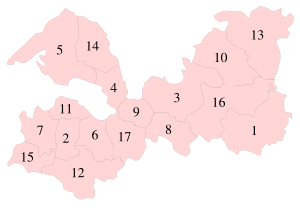 This list includes the districts which existed in the current area of Leningrad Oblast. Budogoshchensky District (the administrative center in the urban-type settlement of Budogoshch), established in 1927, abolished in 1932, split between Dregelsky and Kirishsky Districts. Detskoselsky District (the town of Detskoye Selo), established in 1927, abolished in 1930, split between Tosnensky, Krasnogvardeysky, and Leningradsky Prigorodny Districts. Kapshinsky District (the settlement of Shugozero), established in 1927, abolished in 1963, split between Boksitogorsky and Tikhvinsky Districts. Kolpinsky District (the town of Kolpino), established in 1927, abolished in 1930, split between Tosnensky and Leningradsky Prigorodny Districts. Kotelsky District (the selo of Kotly), established in 1927, abolished in 1931, merged into Kingiseppsky District. Krasnoselsky District (the town of Krasnoye Selo), established in 1936, abolished in 1955, merged into Lomonosovsky District. Leningradsky Prigorodny District (the city of Leningrad), established in 1930, abolished in 1936, split between the city of Leningrad, and Krasnoselsky, Slutsky, Pargolovsky, Vsevolozhsky, and Mginsky Districts. Leninsky District (the settlement of Vsevolozhskoye), established in 1927, abolished in 1930, merged into Leningradsky Prigorodny District. Lesogorsky District (the urban-type settlement of Lesogorsky), established in 1940 as Yaskinsky District and a part of the Karelian ASSR, later of the Karelo-Finnish Soviet Socialist Republic, transferred to Leningrad Oblastin 1944, renamed in 1948, abolished in 1960, merged into Vyborgsky District. Lyubansky District (the town of Lyuban), established in 1927, abolished in 1930, merged into Tosnensky District. Mginsky District (the settlement of Mga), established in 1927, abolished in 1960, split between Volkhovsky and Tosnensky Districts. In 1930 and 1931 was known as Putilovsky District. The current borders of Kirovsky District largely coincide with those of Mginsky District. Moloskovitsky District (the village of Moloskovitsy), established in 1927, abolished in 1931, merged into Volosovsky District. Novoladozhsky District (the town of Novaya Ladoga),established in 1946, abolished in 1963, merged into Volkhovsky District. Oredezhsky District (the settlement of Oredezh), established in 1927, abolished in 1959, split between Luzhsky and Gatchinsky Districts. Osminsky District (the selo of Osmino), established in 1927, abolished in 1961, split between Slantsevsky and Volosovsky Districts. Oyatsky District (the selo of Alyokhovshchina), established in 1927 as Shapshinsky District, in the same year renamed Oyatsky District, abolished in 1955, merged into Lodeynopolsky District. Pargolovsky District (the settlement of Pargolovo III), established in 1927, abolished in 1930, split between Kuyvozovsky District and Leningradsky Prigorodny District. Re-established in 1936, abolished in 1954, split between the city of Leningrad and Vsevolozhsky District. Pashsky District (the village of Pashsky Perevoz), established in 1927, abolished in 1955, merged into Novoladozhsky District. Pavlovsky District (the town of Pavlovsk), established in 1936 as Slutsky District, renamed in 1944 into Pavlovsky District, abolished in 1953, split between the city of Leningrad, Gatchinsky, and Tosnensky Districts. Pikalyovsky District (the selo of Pikalyovo), established in 1927, abolished in 1932, split between Yefimovsky, Tikhvinsky, Dregelsky, Kapshinsky, and Khvoyninsky Districts. Primorsky District (the town of Primorsk), established in 1940 as Koyvistovsky District, renamed in 1948, abolished in 1954, merged into Roshchinsky District. Roshchinsky District (the selo of Roshchino), established in 1940 as Kannelyarvsky District, renamed Rayvolovsky District in 1945, renamed Roshchinsky District in 1948, abolished in 1963, merged into Vyborgsky District. Rudnensky District (the selo of Rudno, subsequently in the village of Vyskatka), established in 1927, abolished in 1933, split between Gdovsky and Osminsky Districts. Sosnovsky District (the suburban settlement of Sosnovo), established in 1940 as Rautovsky District, renamed in 1948, abolished in 1960, split between Roshchinsky and Priozersky Districts. Toksovsky District (the village of Kuyvoz, later in the urban-type settlement of Toksovo), established in 1927 as Kuyvozovsky District, renamed in 1936, abolished in 1939, merged into Pargolovsky District. Uritsky District (the town of Uritsk), established in 1927, abolished in 1930, merged into Leningradsky Prigorodny District. Vinnitsky District (the selo of Vinnitsy), established in 1927, abolished in 1963, merged into Lodeynopolsky District, in 1965 became a part of re-established Podporozhsky District. Voznesensky District (the selo of Voznesenye), established in 1927, abolished in 1954, merged into Podporozhsky District. Yefimovsky District (the settlement of Yefimovsky), established in 1927, abolished in 1963, merged into Boksitogorsky District. Gatchinsky District was known between 1927 and 1929 as Trotsky District, and between 1929 and 1944 as Krasnogvardeysky District. Kirishsky District was known before 1931 as Andreyevsky District. Lomonosovsky District was known before 1948 as Oraniyenbaumsky District. Priozersky District was known before 1948 as Keksgolmsky District. ↑ Государственный комитет Российской Федерации по статистике. Комитет Российской Федерации по стандартизации, метрологии и сертификации. №ОК 019-95 1 января 1997 г. «Общероссийский классификатор объектов административно-территориального деления. Код 41», в ред. изменения №259/2014 от 12 декабря 2014 г.. (State Statistics Committee of the Russian Federation. Committee of the Russian Federation on Standardization, Metrology, and Certification. #OK 019-95 January 1, 1997 Russian Classification of Objects of Administrative Division . Code 41, as amended by the Amendment #259/2014 of December 12, 2014. ). ↑ In 2010, the administrative division of Leningrad Oblast was harmonized with the municipal division, see Отчет о работе комитета по взаимодействию с органами местного самоуправления Ленинградской области в 2010 году (in Russian). Комитет по печати и связям с общественностью Ленинградской области. Retrieved 17 April 2013. Sosnovy Bor was left as the only town of oblast significance, whereas all other towns, which previously were towns of oblast significance, were subordinated to the districts. ↑ Архивный отдел Администрации Мурманской области. Государственный Архив Мурманской области. (1995). Административно-территориальное деление Мурманской области (1920-1993 гг.). Справочник. Мурманск: Мурманское издательско-полиграфическое предприятие "Север". pp. 19–20. 1 2 Постановление ВЦИК от 01.08.1927 О границах и составе округов Ленинградской области (in Russian). BestPravo.com. Retrieved 23 April 2013. ↑ Воробьёв, М. В. (1993). Г. В. Туфанова, ed. Административно-территориальное деление Смоленской области (in Russian). Государственный архив Смоленской области. pp. 118–133. 1 2 Ленинградская область (in Russian). Справочник по истории Коммунистической партии и Советского Союза 1898 - 1991. Retrieved 6 March 2014. ↑ Справка об изменениях административно-территориального устройства и сети партийных и комсомольских органов на территории Вологодской области (1917–1991) (in Russian). Архивы России. Retrieved December 5, 2011. ↑ Ловозерский район (авг.1927 г. - май 1938 г.) (in Russian). Справочник истории административно-территориального деления Ленинградской области. Retrieved 1 June 2013. ↑ Кингисеппский район (август 1927) (in Russian). Система классификаторов исполнительных органов государственной власти Санкт-Петербурга. Retrieved March 27, 2013. ↑ Будогощенский район (авг. 1927 – янв. 1932) (in Russian). Система классификаторов исполнительных органов государственной власти Санкт-Петербурга. Retrieved 27 December 2012. ↑ Детскосельский район (август 1927 г . – август 1930 г.) (in Russian). Система классификаторов исполнительных органов государственной власти Санкт-Петербурга. Retrieved March 19, 2013. ↑ Капшинский район (август 1927 г. - февраль 1963 г.) (in Russian). Система классификаторов исполнительных органов государственной власти Санкт-Петербурга. Retrieved May 14, 2012. ↑ Колпинский район (август 1927 г . – август 1930 г.) (in Russian). Система классификаторов исполнительных органов государственной власти Санкт-Петербурга. Retrieved January 24, 2013. ↑ Котельский район (авг. 1927 – сент. 1931) (in Russian). Система классификаторов исполнительных органов государственной власти Санкт-Петербурга. Retrieved March 26, 2013. ↑ Краснрсельский район (август 1936 г . - декабрь 1955 г .) (in Russian). Система классификаторов исполнительных органов государственной власти Санкт-Петербурга. Retrieved March 19, 2013. ↑ Ленинградский Пригородный район (август 1930 г . - август 1936 г .) (in Russian). Система классификаторов исполнительных органов государственной власти Санкт-Петербурга. Retrieved March 19, 2013. ↑ Ленинский район Ленинградского округа (август 1927 г . - август 1930 г .) (in Russian). Система классификаторов исполнительных органов государственной власти Санкт-Петербурга. Retrieved April 12, 2013. ↑ Яскинский район (нояб. 1944 - окт. 1948), Лесогорский район (окт. 1948 - дек. 1960) (in Russian). Система классификаторов исполнительных органов государственной власти Санкт-Петербурга. Retrieved June 19, 2013. ↑ Любанский район (август 1927 г . - август 1930г.) (in Russian). Система классификаторов исполнительных органов государственной власти Санкт-Петербурга. Retrieved January 24, 2013. ↑ Мгинский район (август 1927 г. - дек. 1960 г.) (in Russian). Система классификаторов исполнительных органов государственной власти Санкт-Петербурга. Retrieved June 20, 2013. ↑ Молосковицкий район (авг.1927-сент.1931) (in Russian). Система классификаторов исполнительных органов государственной власти Санкт-Петербурга. Retrieved April 29, 2013. ↑ Волховский район (август 1927 г.) (in Russian). Система классификаторов исполнительных органов государственной власти Санкт-Петербурга. Retrieved December 14, 2012. ↑ Оредежский район (авг. 1927 – окт. 1959) (in Russian). Система классификаторов исполнительных органов государственной власти Санкт-Петербурга. Retrieved February 8, 2013. ↑ Осьминский район (авг. 1927 - авг. 1961) (in Russian). Система классификаторов исполнительных органов государственной власти Санкт-Петербурга. Retrieved March 7, 2013. ↑ Шапшинский район (авг. 1927 - нояб. 1927) - Оятский район (нояб. 1927 - дек. 1955) (in Russian). Система классификаторов исполнительных органов государственной власти Санкт-Петербурга. Retrieved December 8, 2012. ↑ Парголовский район (август 1927 г . - август 1930 г ., август 1936 г . - апрель 1954 г .) (in Russian). Система классификаторов исполнительных органов государственной власти Санкт-Петербурга. Retrieved April 12, 2013. ↑ Пашский район (авг. 1927 - дек. 1955) (in Russian). Система классификаторов исполнительных органов государственной власти Санкт-Петербурга. Retrieved May 2, 2013. ↑ Слуцкий район (август 1936 - январь 1944 г . ), Павловский район (январь 1944 - июль 1953 г.). (in Russian). Система классификаторов исполнительных органов государственной власти Санкт-Петербурга. Retrieved February 8, 2013. ↑ Пикалевский район (август 1927 г. - январь 1932 г.) (in Russian). Система классификаторов исполнительных органов государственной власти Санкт-Петербурга. Retrieved May 14, 2012. ↑ Койвистовский район (май 1940 г. - октябрь 1948 г. ), Приморский район (октябрь 1948 г. - апр. 1954 г.) (in Russian). Система классификаторов исполнительных органов государственной власти Санкт-Петербурга. Retrieved June 19, 2013. ↑ Каннельярвский район (май 1940 г. - август 1945 г. ), Райволовский район (август 1945 г. - октябрь 1948 г. ), Рощинский район (октябрь 1948 г. - февраль 1963 г.) (in Russian). Система классификаторов исполнительных органов государственной власти Санкт-Петербурга. Retrieved June 19, 2013. ↑ Рудненский район (август 1927 г. - август 1933 г.) (in Russian). Справочник истории административно-территориального деления Ленинградской области. Retrieved June 6, 2012. ↑ Раутовский район (май 1940 г. - октябрь 1948 г. ), Сосновский район (октябрь 1948 г. - дек. 1960) (in Russian). Система классификаторов исполнительных органов государственной власти Санкт-Петербурга. Retrieved June 19, 2013. ↑ Куйвозовский район (август 1927 г . - март 1936 г . ), Токсовский район (март 1936 г. - февраль 1939 г.). (in Russian). Система классификаторов исполнительных органов государственной власти Санкт-Петербурга. Retrieved April 12, 2013. ↑ Урицкий район (август 1927 г . – август 1930 г.) (in Russian). Система классификаторов исполнительных органов государственной власти Санкт-Петербурга. Retrieved March 19, 2013. ↑ Винницкий район (авг. 1927 - фев. 1963) (in Russian). Система классификаторов исполнительных органов государственной власти Санкт-Петербурга. Retrieved November 16, 2011. ↑ Вознесенский район (авг. 1927 - апр. 1954) (in Russian). Система классификаторов исполнительных органов государственной власти Санкт-Петербурга. Retrieved November 16, 2011. ↑ Ефимовский район (август 1927 г. - январь 1965 г.) (in Russian). Система классификаторов исполнительных органов государственной власти Санкт-Петербурга. Retrieved May 14, 2012.